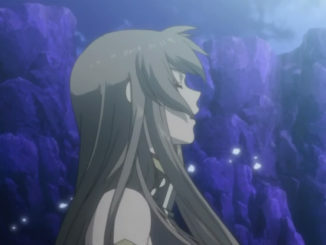 Warning: Tales of the Abyss spoilers, obviously. 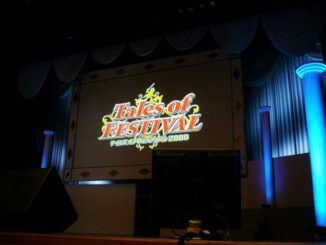 The stage play opens with Anise rushing onstage and greeting the audience, waving her penlight (the red one being sold in the venue), followed by Luke and Tear (with penlights too). She seems really excited, and goes along with the thought that everyone’s celebrating her birthday. But Luke and Tear would not have any of it, including Mohs, who suddenly appears from the back with several light sticks on hand–think Mohs with red penlights ala Wolverine claws, if that gets the image across. Even Jade pops in as a skit face onscreen, voiced by Koyasu (I think he says something about Ion… about what he might do if he found out? Or something along those lines, my memory’s kinda fuzzy in that regard). Even then Luke, Tear, and Anise (but mostly Anise and Luke) spend a lot of time trying to get the crowd hyped up with various iterations of <noun> warukuneeee and getting the crowd to do Raijinken. At least until Asch comes busting in and tells them to cut it out. 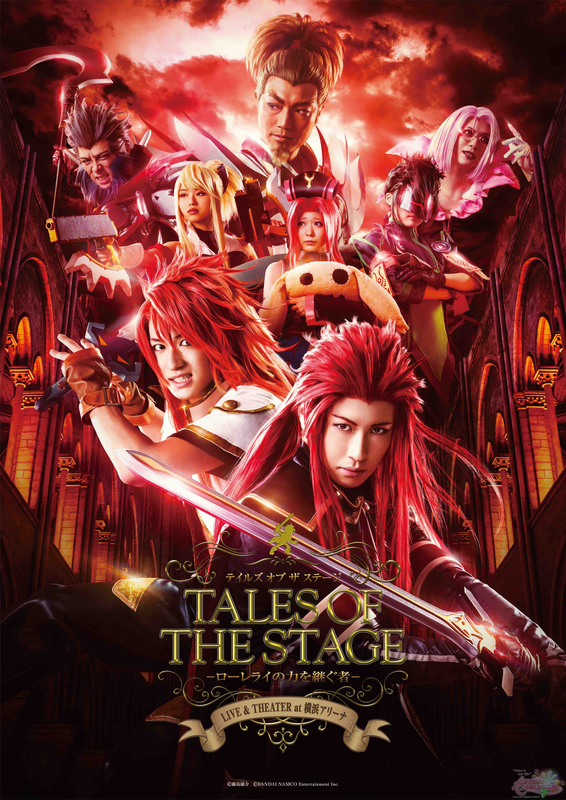 Which they do, and Asch starts with a serious introduction to the stage play, which gets cut off by Anise doing a really good imitation of him telling them to cut it out earlier, and Anise gets chased off stage by Asch. And, the stage play starts, with of course, Karma. They did something nice and montage-y with it, where some pre-game events were demonstrated by the cast, like Dist remodeling Tokunaga for Anise. The first scene, as I recall, was a rehash of Asch discovering he’d been replaced, and seeing how Natalia treats Luke without knowing he’s his replica. The next scene was one in Nam Cobanda Isle, where it’s shown how Asch recruited the Dark Wings. I think Noir’s companion here was York…? Not too sure. I think it was around this time that the play cut to Engeve, where Tear and Luke were preparing meals, with Tear preparing a rather giant riceball. There was something about miso here (helping out with it, as I recall), and Tear asked one of the people in the audience to choose if they’d assist or not. The audience member ended up choosing “It can’t be helped” and yeah, Luke helped out with miso stuff. Tear also asked another audience member to choose between her and Natalia, but the audience member chose Anise for some reason lol. Eventually, a second audience member chose Tear and the stage actor looked so happy hahaha. There was also a meeting among the Six God-Generals, but all I can remember from it (and throughout the stage play) is Dist on wheels. Instead of his floating chair, he was on some sort of rollers the entire time past the opening. It was amusing. The scene skipped to Zao Ruins and we got Luke vs Asch, and the party against Largo, Legretta, Sync, and Arietta, if I recall correctly. It was also around this time we got Anise and Arietta in some sort of cat fight, where they were pinching each other’s cheeks and Largo looked like some sort of unintentional referee. A little later was also a point of audience participation, where Luke explicitly asks Largo to stop mid-attack (and he agrees, oh my), and then asks the audience to shout Raijinken with him. Which, of course, causes Largo to faint. Akzeriuth isn’t really touched upon so much, and there’s a focus on the Asch and Luke replica confrontation scene, as well as the party deciding what they should do post-Akzeriuth. It goes more or less the way the game does, and there’s a skip to Ortion Cavern. Guy splits from the team at this point, and Asch, Natalia, Anise, Ion press on. With Anise… insisting on using a save point. Which everyone goes with, and we even get a save screen for it. It turns out to be a good thing, since the party gets wiped out by a surprise attack (complete with Asch’s sword… missing a blade for some reason). Complete with a game over screen. But after some fuss on Anise’s end, the “save” is reloaded, and they… run away from the battle. Discovering Van’s replication plans more or less go down the same way they do in-game (Asch saving Natalia, having a bit of a talk with her), but with maybe a little more Anise feeling like a third wheel. Asch gets some headaches at this point, if I remember properly, and later on, in another scene, Dist instead of Spinoza ends up explaining the Big Bang and relevant stuff (if not something along those lines). Still, the craziest of the day’s antics is yet to come, and I’ve got to say the scene at Chesedonia takes the cake. I can’t recall the exact circumstances as to why the party found themselves in a bar of some sort (I think it may be a callback to how they got blocked by the Dark Wings asking for a toll? ), but in either case, we have the party watching Van, Legretta, and Arietta putting on a dance number along with Noir, wearing something that certainly isn’t Oracle Knight standard issue. It was some sparkly shirt for Van, is what I remember best, as with his sunglasses for the occasion. 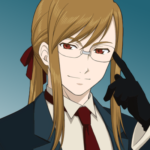 It’s around the time when Chihiro Suzuki shows up as the owner/manager of the establishment and causes a lot of confusion due to the fact that he sounds like Luke (also he calls Van, Legretta, and Arietta and they deny being them). He also knows no fear and starts poking fun at Van-sensei, inc But yeah, he gets into this argument with the Luke stage actor and begins shouting out Luke’s attacks and ends with Lost fon Drive (which seem to affect the stage actor). Later on, Asch also shows up, and Chi-chan ends up putting on his Asch voice and causes more confusion (including towards Natalia, who stills at his voice). Koyasu as Jade eventually pops in and asks Luke what he’s doing, more conversation follows, then Jade calls him a bad boy or something along those lines, which is followed by, of course, an “ore wa warukunee”… (which Jade says in a more yasashii voice). A little later, Jade decides it’s a good time for an Indignation, which the audience gets to shout out along with him. We also get Largo in a suit, who claims not to be Largo (?). And is some red lion (?). After the advertisements (for Emotional Act) and chitchat between Luke/Asch and Jade, everything (thankfully or not) turns more serious for the most part. We get things like Natalia being outed as the “fake” princess, and the audience being the Kimlascan townspeople shouting her name (similar to the way she was protected by her people in the game). There’s also a small scene with Arietta dancing around Feres. Then we get the infamous Aschtalia promise scene in Sheridan. The stage play also has an interesting take on Sync’s death. The party fights him, and there’s a portion where they try to stop him from doing suicidal stuff when it’s revealed he’s an Ion replica, but they can’t really stop him from falling to his death, just like in the game. Then we get a Van vs Asch scene, which actually goes in Asch’s favor for the most part–until he gets a headache which is so bad that he drops to the ground, and Van ends up turning the tide. Which means that it’s time for another dance number and fight. The party fights Van, and they successfully defeat him. But Van gets revived, complete with a dance number, and we also get Sync back, in his new outfit from the last part of the game. 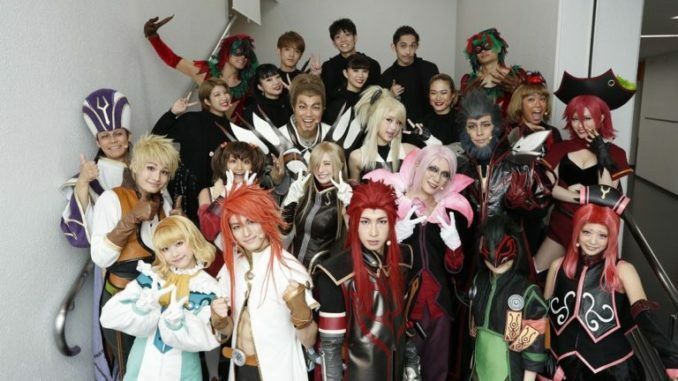 The stage play ends with Asch getting the Sword of Lorelei, and after the curtain call, a small talk show was held. So basically, the stage play skipped around a lot, and there was a lot of crack. There’s not really any significantly new scenes, I feel (of relevance I feel would be recruiting the Dark Wings, as with how they handled Sync’s death), and it was mostly just fun crack. Which I do not really mind, I really enjoyed the stage play despite being all “what the heck did I just watch” when I try to recall what just happened. I think involving the audience through subevents kind of led to the craziness and wackiness of the stage play overall, but I don’t think it’s exactly a bad thing per-se. We were somewhat forewarned, after all, by what was on the website with regard to what was in-store, and I suppose this further drives home the point/promise of the Emotional Act stage play to be closer to the main story, rather than being an original one the way the Yokohama Arena show was. 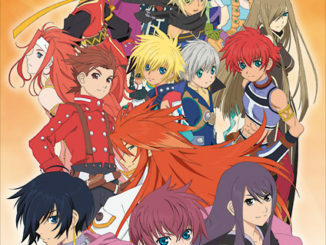 With regard to cast members that stood out, besides the star of the show (Asch), I would say Van, Sync/Ion, Anise, and Dist were pretty interesting to watch. Master Van because of the dance numbers again, Sync/Ion because of the way the stage actor had to switch between the two, Anise because that hyperactiveness/genki levels are just really off the charts (and quite entertaining), and Dist because the stage actor really, really nailed him (not to mention, staying on those rollers or whatever it was called was pretty amazing in itself, even if it does has something like a balancer). I’d actually like to take this opportunity to applaud Dist’s stage actor (Orito of Starboys), for a job well done. I’ve seen his tweets the past few months about getting into Dist’s role and he’s really dedicated to his craft, I’ve got to say. It was revealed in the talk show that he got over a hundred hours on his Abyss save (and would play it during breaks while practicing, I think? one of the stage actors mentioned seeing him play, if I recall correctly), and he also nails Kazuki Yao’s voice for him. He makes some IC Dist tweets at times too and it’s really great of him, ahaha. As for Jade, Koyasu actually didn’t appear too much (or as much as I wanted to, but that’s just my bias speaking), but what little moments we got were nice. In the plot itself, his presence is mostly handwaved. But more relevant to the stage play, I suppose, would be how Asch-centric it is. And I think if you take out the crack, it is quite Asch-centric, even if my report doesn’t make it sound like the case, given how I remember the crack bits better. Anyway, that’s all I remember for now! If anyone has questions about what happened, I will try to answer stuff to the best of my abilities, though fair warning I might not remember everything that occurred. That, and I welcome any corrections in case I misremembered or misinterpreted anything. I wrote all of this while everything is fresh in my mind, meaning that all of this was typed past midnight, and may contain typos and the like, especially with my brain not really operating at an optimal condition.